Eli 8.0 drew that back in April. I think I can say, with no equivocations, "mission accomplished." I can still remember writing a post about us practicing in the living room in April. We had about 20 feet of space, and the first time he made it to the edge, we had a big celebration. Two weeks ago, he had a ride of about 1.5 miles. We don't ride very fast. 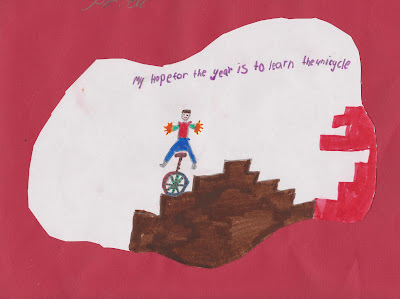 A unicycle is a remarkably inefficient mechanism, at least when it has a 20" wheel (Eli) or a 24" wheel (me). We went to a track one day last month, and Gloria came with us to get her run in. She runs at about 10 minute mile pace, and neither one of us could keep up with her. So on Eli's long ride, he rode for over 15 minutes. I think he's almost to the point where riding a unicycle is about as difficult as walking. He can free-mount with ease, he can go over most speed bumps, and he can keep riding when my own legs are about to explode. What we've been doing for the last month, usually, is play follow-the-leader. We go up to a high school near our house that has huge parking lots, a network of roads, and long sidewalks. Then we just follow each other, with the leader choosing where to go. This can get surprisingly technical compared to just riding in a straight line or riding around a track, and there are several places where there are sharp elevation changes. It's made me a much better rider, although it's also very draining to keep up with a 55-pound infinite energy source. My left knee, also known as "Strawberry Fields Forever," offers harsh proof of that. It seems like I take it least one bad fall every time we ride, and invariably, I land on my left knee. And bleed. We still ride three days a week, for about an hour. In that time, and with a few breaks, we usually cover about 2 miles. That doesn't sound like very far when I write it, but it feels far in person. I've been wanting for several months to have one ride over a mile. I've gotten steadily better in terms of my skill, but it's just never happened. Last Sunday morning, though, we went to a shopping center called The Domain (no one there on Sunday morning, and lots of sidewalks and parking lots to ride on). We started our last ride, and I rode and rode and rode. Eli stepped off once, took a little break, got back on, and I was still riding. Of course, when I finally did stop, it was with a gigantic, bloody wipeout instead of a graceful step-off, but I didn't really care. It was a 13 minute ride. 1.12 miles. That sounds completely ridiculous, given that I was riding 20 feet three months ago, but the unicycle is very fair. I just had to put in the time.